Click symbol above for definition. THE INNER GAME: Here you can explore Inner Game content by categories. Each move has been assigned a Primary Category and possibly one or more Secondary categories. There are nine(9) categories to choose from. There are also four(4) special categories for specific types of creative content called ProductionCategories. Read below to find out why we chose these specific numbers. The number nine was chosen because it is a cool number. Nine is one of the most universally powerful and magical numbers. The 3X3 magic square appears in the cultures of Islam, Jains of India, Tibetan Buddhism, Celts, African, Shamanic, Norse, and Jewish mysticism. Odin was the ruler of nine worlds and hung for nine days on the Yggdrasil tree. The Greeks honored nine muses. The Egyptians honored a company of nine gods. Nine was the central number of Celtic tradition. 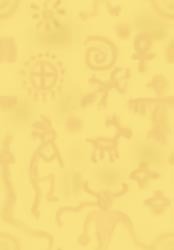 Native American, Aztec, and Mayan myth recognized nine cosmic levels (four above, earth in the center, and four below). The Chinese saw the 3X3 magic square as a harmonious blend of the nine archetypal principles of number and a paradigm of cosmic structure and process, mirroring the supreme order of the universe. Four is a powerful number too. It represents the four directions, the four elements (fire, air, water, earth), and the four basic aspects of humans (emotion, spirit, intellect, and body). Now, as if these numbers weren't cool enough on their own, check out the design to the right. This is a Hopi symbol for Mother Earth. Similar labyrinths, based on squares or crosses(4) and drawn using nine(9) points, are found around the world, from ancient Greek and Renaissance gardens to the labyrinth at Chartes Cathedral and the Arizona Tohono O'Odam tribe's Man in the Maze(I'Itoy). These labyrinths are metaphors of our journey through the earth and our unconscious to our spiritual core. This parallels much of what we are doing with our Bead Games. And for the final kicker, these numbers (9 and 4) added together make 13 which, when multiplied by 9, equal 117; the number upon which the Symbol is based.